Artisanal Fishing Craft and Methods of the River Severn and Great Britain. The rivers of the North Atlantic once teaming with the Atlantic Salmon developed their own localised methods of fishing - our local river, the Severn, was no exception. Having the second highest tidal range of well over 40 feet at times and its vast areas of mud and sand flats made it a most challenging and rewarding fishery. 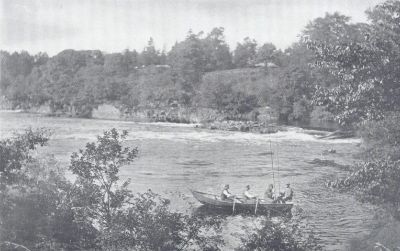 The principal methods of fishing which were employed - Fishing Weirs - constructed from funnel shaped fishing baskets on frames to catch the salmon on either the flood or the ebb tide. Lave Net Fishing - a "Y" shaped hand held net with which the athletic fisherman would chase the "loom", the wake formed by the salmon as it dashes through the muddy waters seeking the refuge of deeper waters as the tide recedes. Draft or Seine Net Fishing and Stopnet Fishing - large "V" shaped net from 20-26 boats moored across the treacherous currents. Few fishermen remain on the Severn - those that do making little money for their toils whilst maintaining a way of life gone by. The rivers of the Severn Estuary reflect many of the problems that have beset the fish throughout many Northern Atlantic rivers. Fisheries Protection and Management is certainly nothing new and over 700 years ago the first records of the move to ensure free navigation on rivers was the provision for a passage being "wide enough for a sow with her five little pigs to enter". Obviously, there was a campaign for plain english even in medieval times. By the reign of Edward XIII in 1285 it was recognised that a closed season was necessary and the concept of "authorised" nets was introduced in 1376. By the reign of Elizabeth I a minimum catch size of 16 inches was recommended. By the early 1800s excessive netting in estuaries and rivers along with the advent of the industrial revolution caused further measures covering pollution, closed season and weekly closed times; mesh and net size regulations; recruitment of water baliffs. But with little or no parliamentary action and no national authority the situation continued to decline. As a result of this, a Crown Commission was appointed in 1860 to address defective regulations, poaching, obstruction of free passage for fish and the lack of management. Much of this legislation is still in place today with the appointment of Boards of Conservation and Fishery Boards controlling fisheries. These regulations and traditional in-river fishing methods appeared to address exploitation of fisheries, even so, many rivers were beset by industrial and urban pollution reducing catches and effectively killing some rivers. Poachers spearing salmon. This form of poaching involved "Burning the waters". The adult salmon returns to the breeding grounds in the gravel beds of the upper rivers, breeding through the winter with its young spending between 2-3 years in the river before they head for the ocean to find feeding grounds. Little was known about their life at sea so the species remained relatively unharried and it was hoped that with improving water quality the future for the king of fish would be secure. However, during the 1960s their feeding grounds were discovered in the northern waters of the Atlantic off the Faroe Islands and around Greenland. Devastating overfishing then took place using modern fishing techniques and monofilament nets. By 1981 over 1000 tons of fish were caught off the Faroe Islands alone. The future for the salmon was bleak and would have been exhausted within a decade. These salmon would have originated from many different countries of the north east and north west Atlantic - conservation measures at sea became a priority. The North Atlantic Salmon Conservation Organisation was established, the number of fish is now closely monitored, factory fishing is now suspended and what fishing remains is of a subsistence level. This work is ongoing, as "buyouts" have to be re-negotiated, there is piracy at sea and changing legislation. The much depleted stock has to overcome existing and new perils - disease such as sea lice, industrial harvesting of species which form a large part of the salmons diet, coastal and offshore drift net fishing, poor water quality - particularly in their spawning ground - due to water abstraction and agricultural run offs, need to improve riverside management, predation and also the effects of climatic change and the plight of the salmon is still in question. The new century saw the publication of the MAFF Salmon and Freshwater Fisheries Review - the overriding aim is to ensure the preservation of the species. A most comprehensive report which, if implemented, would be greatly beneficial to many forms of wildlife in and around our waters. All interested parties, which were not always "mutually compatible", were invited to contribute and all 195 recommendations were unanimously agreed upon, however, many of these are still under consideration by the Government. The "Coble" developed for the seine net fishermen of the north east was also an excellent craft for the sports rodsmen. To put the report in terms of pigs and piglets is difficult however. All mixed stock fisheries banned or bought out i.e. no high sea fishing. Fish only to be caught in the river of origin and only when it can be shown that sufficient fish are returning from the sea to ensure an adequate breeding stock in that river and other similar recommendations. 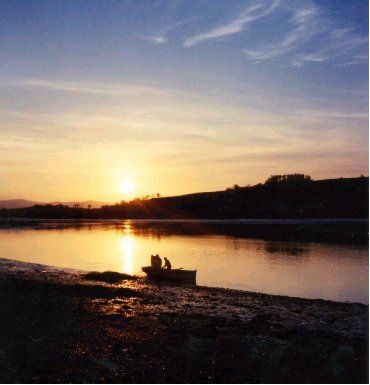 In March 2003 the Severn Estuaries Action Plan highlights a further need for reduction in fishing effort however the heritage and cultural value of some of these fisheries is recognised. The limited few remaining traditionally run fisheries will be allowed to continue with annual reviews. 2004 saw an increase in the numbers of salmon returning from sea to some UK rivers, however, conclusions should not be drawn from one year's figures, but it certainly is an encouraging sign. The Atlantic Salmon is part of our countrys folklore and heritage, an indicator species of the state of the environment, it is probably one of the most studied and protected fish native to our shores and rivers with many individuals, Trusts and Environmental Groups working towards sustainability. There is a certain sense of achievement in restoring these traditional fishing vessels, however, this is tinged with a feeling of sadness that fish such as salmon, cod, herring, plaice and others, which man has harvested for so many years and spawned so many traditional and evocative boats and communities around our shores are in a state of serious decline.